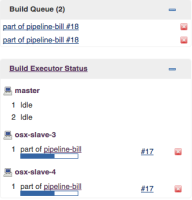 Building a pipeline job with parallel steps, whenever I cancel a parallel step that waits in the Build Queue, the corresponding job hangs. echo "branch 1: here is something that happens in stage one"
echo "branch 2: here is something that happens in stage one"
Possibly fixed as part of JENKINS-34281. Jesse Glick added a comment - 2016-06-20 14:42 Possibly fixed as part of JENKINS-34281 .